From the outset, romantic relationships have been a very popular focus of movies. Even when the movie doesn't fall into the romance genre, some kond of pairing or another will factor into the story. Let's face it, love can be very complex and audiences like to see romantic entanglements played out on-screen, even if it's just the subplot of a movie. When a relationship takes center stage in a film, it must be handled delicately. (Although, most movies don't seem to understand this.) If it's too perfect, audiences won't buy it and if it's too dark, it can be unappealing. The Disappearance of Eleanor Rigby takes a very realistic look at a relationship and pushes the boundaries of the "slice of life" film. The Disappearance of Eleanor Rigby introduces us to Eleanor (Jessica Chastain) and her husband, Conor (James McAvoy), a couple who live in the city. As the film opens, Eleanor rides her bike to the middle of a bridge, dismounts, and then leaps into the water. We next see her in the hospital, with Conor by her side. But, she then abruptly leaves the hospital and moves in with her parents (William Hurt and Isabelle Huppert) in the suburbs. Eleanor begins to take some college courses taught by Professor Friedman (Viola Davis), who becomes her mentor of sorts. Meanwhile, Conor is attempting to deal with Eleanor's sudden disappearance, while also overseeing the restaurant he runs with Stuart (Bill Hader). One Conor learns where Eleanor has gone, he attempts to approach her, but she rebuffs him. As the story progresses, we learn what has caused Eleanor's behavior and what has driven a wedge into this couple. Writer/Director Ned Benson makes his feature film debut with The Disappearance of Eleanor Rigby and he's certainly taken some risks with the narrative. The movie drops us into Eleanor and Conor's relationship with no backstory or clues. We must watch this relationship dissolve and then slowly learn what has happened. For this approach, Benson could have easily resorted to flashbacks or cut-aways, but, instead, he simply lets the story play out and through bits and pieces of dialogue, we begin to guess what happened and we are finally given an explanation in the third act. However, even then, this explanation is sorely lacking in details. 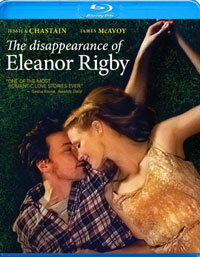 Yes, The Disappearance of Eleanor Rigby is a movie which runs on mood and emotion. There is a story here, but it's a very simple one -- a couple has issues which leads to a separation. The focus on the film is more about Eleanor and Conor finding themselves while being apart. Eleanor dives into academia and spending time with her sister, Katy (Jess Weixler). At the same time, Conor's struggles with his restaurant lead him to have a heartfelt talk with his father, Spencer (Ciaran Hinds), a famous restaurateur. There is certainly drama here, but it is of a small and quiet kind. Other then the reveal of what happened to allow Eleanor and Conor to drift apart, there are no plot twists. What we have is a methodical study of a relationship. Is it realistic? I would certainly say that some of it is. Eleanor’s reaction to what happened may be extreme, but it definitely rings true. The big question here facing The Disappearance of Eleanor Rigby is -- Is the movie too “art house” for its own good. The answer to that may be yes. Again, Benson does not spoon-feed the audience here and the inpatient may find the movie to be exhausting. Things certainly happen in the movie, but the bulk of them aren’t very dramatic or exciting. This is a small movie which tackles some big themes. But, those who hang around until the end will see the whole thing come full circle. Both Chastain and McAvoy give very good performances here, as Eleanor and Conor aren’t always likable, but we still want to see where this story is going. The movie also gets a much needed boost of levity from Hader. If you are sick and tired of Nicholas Sparks-type romances, then The Disappearance of Eleanor Rigby may be the perfect remedy for you. The Disappearance of Eleanor Rigby needed subtitles whenever Huppert was on-screen on Blu-ray Disc courtesy of The Weinstein Company. The film has been letterboxed at 2.35:1 and the Disc contains an AVC 1080p HD transfer which runs at an average of 30 Mbps. The image is very sharp and clear, showing no obvious grain and no defects from the source materials. The film has a very natural look and the colors are fine. The image is never overly dark or bright. The depth is notably good and the level of detail is good as well. The Disc carries a DTS-HD Master Audio 5.1 track which runs at 48 kHz and an average of 4.0 Mbps. The track provides clear dialogue and sound effects. Again, this is a quiet film and most of the audio effects are quite discreet. We do get some mild stereo and surround effects during the street scenes, but otherwise, the audio comes from the center channel. The Disappearance of Eleanor Rigby Blu-ray Disc contains an interesting assortment of extras. The lone special feature on Disc 1 is a "Q&A with Jessica Chastain & James McAvoy" (21 minutes) which is moderated by Thelma Adams and was recorded at a screening in New York in September, 2014. Here, the two actors talk about their experiences on the movie. Disc 2 offers two alternate cuts of the film. "Her" (106 minutes) focuses on Eleanor's story, while "Him" (96 minutes) tells the story from Conor's point of view. This is an intriguing experiment, as it does create three differing versions of the film and these two cuts contains scenes which aren't in the "Them" cut.